Blink Brow Bar > Blog > Eyebrow Shaping Vancouver > T’is the Season for Beautiful Brows! Now, we’re not saying that if you leave those brows till the New Year that you’ll end up on Santa’s naughty list, but seriously, brows are the focus this season. And fellas, you’re not off the hook either! Eyebrow threading is a big trend for men as well as women around the world now. How big is the brow scrutiny? Beautifully sculpted and arched power brows are all the rage in Hollywood and fashionable circles, and Catherine the Duchess of Cambridge is credited with yet another #KateEffect as her well-defined brows are trending across the UK and around the world. When Justin Trudeau won the recent election by a landslide, do you know what appeared in the coverage by Britain’s respected newspaper The Guardian? 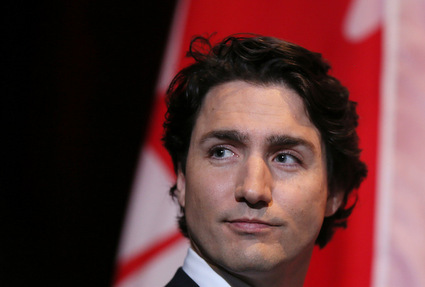 Eyebro: Justin Trudeau, Canada’s new prime minister, gives good brow (and here’s how!). Seriously! Our new prime minister’s eyebrows were a journalistic scoop. Mind you we have to agree with the fashionistas at The Guardian that Trudeau’s brow’s are “well-sculpted, with an excellent thickness between the start and the tail” and to achieve the look men should “visit your local threading salon.” Vancouver men can come and see us in Blink Brow Bar in Vancouver’s beautiful Coal Harbour neighbourhood! When you head to festive celebrations this month, Elle Canada’s holiday beauty tips and 15-minute party looks include ways to achieve flawless brows. They caution against heading out with over-plucked or bushy brows (if you come to us you won’t have to worry about that because here’s what #BlinkBeauties say about our eyebrow threading services!) and recommend using eyeshadow that matches the shade of your brows to fill in your brows. Definitely a quick and easy party look when your brows are already at their best! Beauty expert Bahar Niramwalla (@BaharNiramwalla) told The Kit exactly how 20-somethings should be cheeky and bold with their brows and bright cheeks this party season. If you need help learning the technique to accentuate bold brows, come see our Blink Brow Bar Vancouver eyebrow threading specialists. We can also help with tinting brows and lashes as well as eyebrow threading. And if you feel like you need a little more sparkle this holiday season, consider blinging up those brows. That’s right! You can pretty up your brows with Swarovski Crystals created just for brows.The tiny brow studs called Benefit’s Bling Brows are the creation of Swarovski, Nylon magazine, and Benefit cosmetics. Ready to get the perfect look for under the mistletoe this year?